Michigan Radio has been recognized with four regional Edward R. Murrow Awards in the Large Market Radio category. The Murrow Awards are presented by The Radio Television Digital News Association (RTDNA) to honor outstanding achievements in electronic journalism. The station won awards in the Investigative Coverage, Documentary, News Series and Website categories. 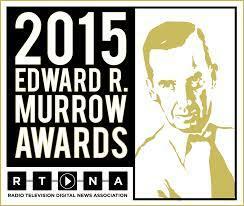 All four winners will now be eligible to win a national Edward R. Murrow Award. Best Investigative Coverage was awarded for the story What is the condition of the oil pipeline under the Great Lakes?, produced by Mark Brush for the station’s M I Curious project, a unique news experiment in which reporters investigate questions submitted by the public. Brush’s reporting examined the status of the aged Enbridge oil pipeline running through Lake Michigan at the Straits of Mackinac. His investigation involved interviewing company representatives, federal government regulators, pipeline safety experts and state officials, and obtaining more than 30 hours of video footage of the pipeline itself. Finding Home, the Best Documentary winner, is a moving portrait of life in Michigan’s foster care system and a look at what it feels like to be removed from your parents’ home and placed in foster care. Produced by Reporter Jennifer Guerra and edited by Sarah Hulett, with contributing reports from Sarah Alvarez, the documentary is part of Michigan Radio’s ongoing “State of Opportunity” project that is looking at what can be done to break the cycle of poverty and improve opportunities for Michigan’s most disadvantaged children. One Company’s Toxic Legacy won for Best News Series. Produced by Rebecca Williams, Lindsey Smith, and Mark Brush, and edited by Sarah Hulett for the station’s weekly Environment Report feature, the five-part series examined the ripple effects left behind from Velsicol Chemical’s (formerly Michigan Chemical) accidental contamination of the state’s food supply over 40 years ago. Michigan Radio reported on how the chemical contamination is still affecting people in Michigan today. The station was also recognized in the Radio News Website category. Led by Digital Editor and Senior Producer Mark Brush, with contributions from the station’s entire news staff, Michigan Radio’s website (www.michiganradio.org) presents unique online content as well as incorporating multi-media elements into the station’s audio stories. Michigan Radio competes in Region 7 in the Large Market radio category, which consists of public and commercial stations in Michigan, Ohio, Indiana, and Illinois. Michigan Radio won more regional Murrow Awards than any other station in the Region. Regional winners automatically advance to the national Edward R. Murrow Awards competition, which will be judged in May. Murrow Award recipients demonstrate the spirit of excellence that Edward R. Murrow made a standard for the broadcast news profession.